Real VU meter to accurately set gain. Clean up your stage and your sound with this hot new product from L.R. Baggs! Combining the features of at least three foot pedal boxes into one pro box, the new Venue DI brings a new level of fidelity, confidence and usefulness to performing acoustic musicians. The Venue DI is the most comprehensive and best sounding tool ever to tame the surliest stage. The Venue DI is a beautifully packaged road worthy floorbox that has everything you need to get the perfect acoustic tone from your guitar in any live venue. 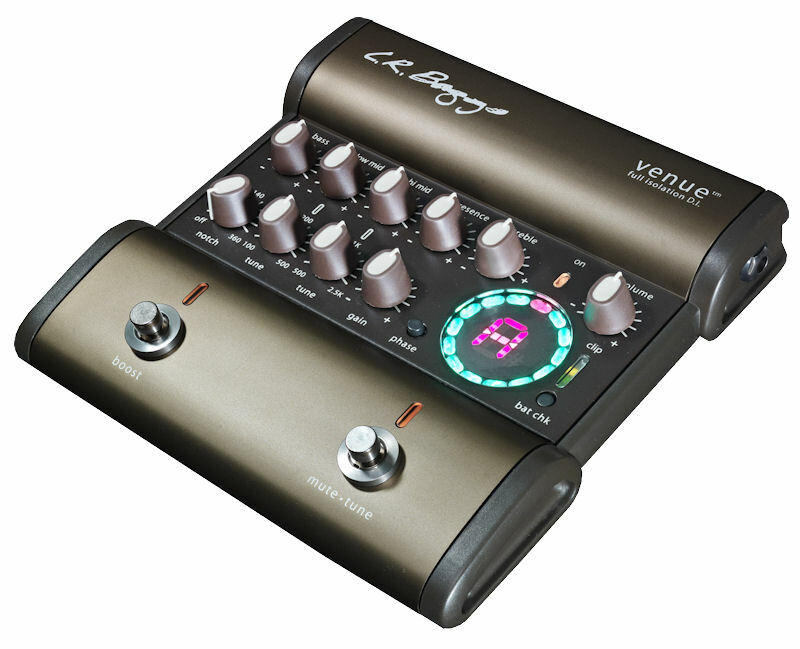 The Venue DI features a high-end audio transformer coupled XLR for full immunity from ground loops. Built with 100% All Discrete Class A Circuitry and EQ for sweet, transparent and ultra quiet sound, this preamp boasts Bomber construction with metal shaft potentiometers. Controls include an adjustable Gain to handle most passive and active inputs, a Garret Null notch filter to non-destructively handle feedback, and phase inversion for best sound and feedback control. The tunable low and high mid controls allow precise frequency adjustments, and a full chromatic tuner with a footswitch mute/tune function is included. The Venue DI also has a real VU meter to accurately set gain, and a series effect loop. Works with a standard 9 volt battery or optional DC adapter (not provided). A four segment battery status gauge makes it easy to determine how much battery power is remaining. Assembled in the USA with 100QC testing.